An Apple patent dating back to August 2015 has just surfaced, illustrating a scroll-like device with a bendable display. The design features two barrels into which the screen can roll up and be stored away, making for a smartphone or tablet that can be kept in a much more compact form factor when not in use. The two barrels would house all of the device’s internal components between them, according to the filing. They would also contain either mechanized rollers or static structures around which the panel would coil. The screen would deploy and retract through a system of latches and springs, along with a brush to clear any potential debris as the device is returned to its stored state. As AppleInsider notes, the distance between the two cylinders when unfurled is suitable for a pair of cameras, one on each chassis, that could create a stereoscopic 3D effect. To make the most of limited space, the patent presents the possibility of stowing much of the circuitry within the rollers. 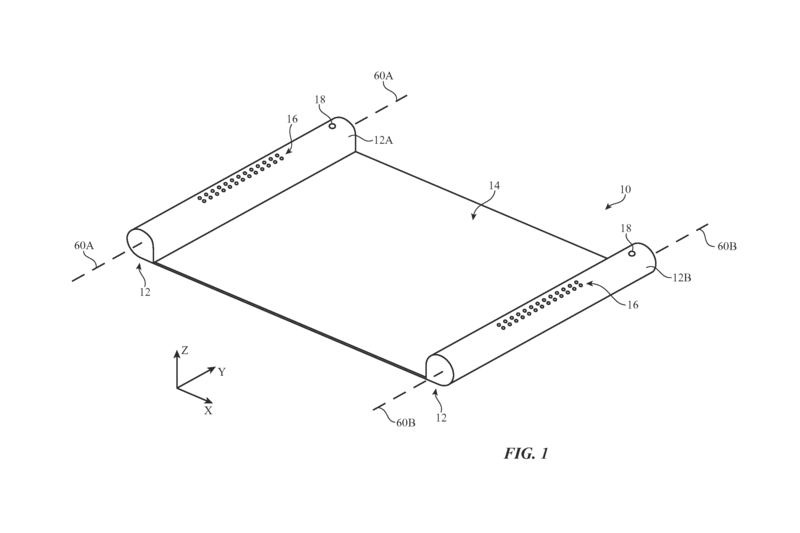 Apple specifically mentions OLED technology to power the flexible panel, and in the patent considers the usage of elongated metal support beams, running perpendicular and parallel to the device, that can keep the screen rigid when being used and snap and become flexible when it is rolled away. When not in use, magnets will hold the two barrels tightly together. With Apple reportedly still struggling to lock down supply for conventional OLED displays in its upcoming iPhone, we are assuredly many years away from such a device coming to fruition. Flexible screens, though, are very much real, have been tried before, and could even return later this year in a completely foldable phone from Samsung or LG. However, the ability to mass produce them with the same kind of fidelity found in typical panels, along with the tight packaging and engineering challenges presented by Apple’s proposal, means this particular implementation is still in the experimental stages. LG G6 vs. Galaxy S7 vs. Galaxy S7 Edge: How does LG's best stack up to Samsung?